It's the start of travel season and one of your best "go-to" pieces is a maxi. 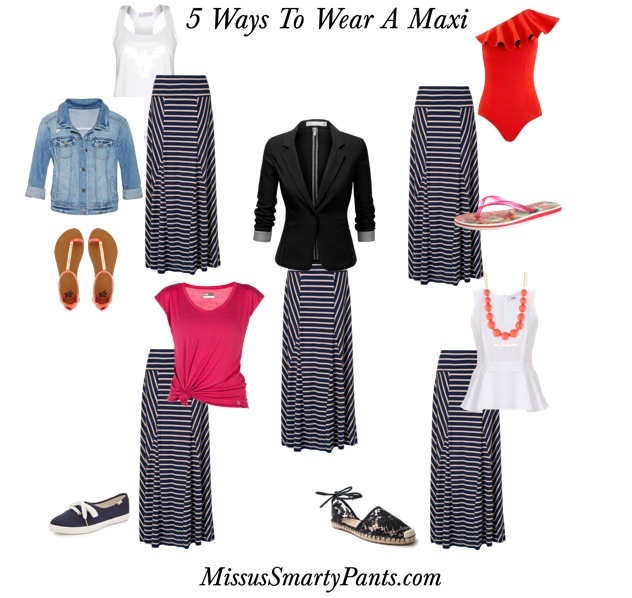 Maxi skirts are comfortable, keep you cool (yet covered) and can be dressed up or down. They are perfect for travel! My MSP Style Membership made all the difference in the world! Hopefully this won’t be too lengthy! I signed up for your style services after hearing you on an interview with Hannah Keeley in January of this year. I’m so glad I did and for the first time in my life shopping has actually become more fun instead of frustrating. I chuckled to myself after reading this week’s article. I knew that I had jury duty coming up this week and I was chosen to be a juror. I feel like all of your advice p to this point was training me for this “style mission” of being a presentable looking juror. Ever since I purged my closet, I only had two pairs of pants to work with (one black and one white), one black bell sleeve cardigan, one black lightweight sweater, and about six short sleeve shirts that worked with my Winter coloring. It was kind of fun at the end of the day planning different looks with what I have in my closet for right now. I know if I hadn’t found out about your services, I would be doing last minute shopping, wasting time and money as usual. Thank you for all that you do!